The Discovery Sport will be the first in the line of a new family of Discovery branded vehicles. This particular vehicle starts off a whole new vertical for Land Rover, the parent company, and will stand alongside the Land Rover and Range Rover brands. 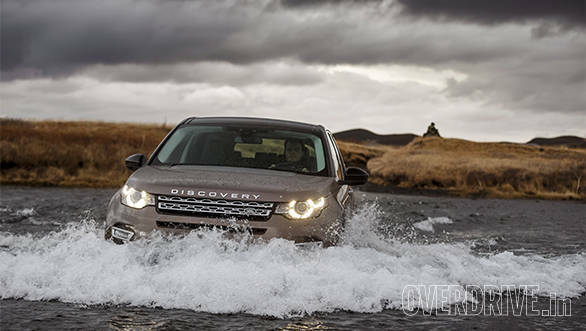 The Discovery brand will also help bridge the gap between Land Rover and Range Rover products in various segments, exactly what the Discovery Sport intends to do. It is sort of a middle order SUV that will find itself replacing the Freelander but is positioned to plug the gap between the Freelander and the Evoque. This also means the Discovery Sport will find itself going up against the Audi Q5, BMW X3 and the Mercedes-Benz ML-Class. Replacing the Freelander will mean the Discover Sport will be the most affordable SUV in the entire JLR range, until something else comes along. The Discovery Sport though is an extension of the Evoque platform with a longer wheelbase and more utilitarian aggregates. That sort of explains why the exteriors may seem all too familiar. The clamshell bonnet, the sculpted grille with the slim headlamps, they're all derivatives of the Range Rover family. But underneath it all, the Discovery Sport is a more modern version of a Freelander which lacks the all aluminium architecture of the Range Rovers yet has enough new bits to make it interesting. I personally don't find the styling very interesting. In fact, I find the way it looks boring. But the styling plays a very important part since the design conforms to stringent pedestrian safety norms and enhances aerodynamic efficiency for lower emissions and fuel saving. The Discovery Sport is also the first SUV within the family to get the pedestrian airbags which are deployed at the hood just under the windshield. This is, however, a market dependent feature and whether India gets it or not is still to be seen. On the inside, the interior styling too is very familiar. If you've seen the Range Rovers you know what I'm talking about. It's just the positioning of various controls that has changed otherwise the large yet slim dashboard split by the wide centre stack is similar in form and function to its siblings. The control knobs and stalks also feel the same, the only difference here being the Terrain Response system where you may notice the absence of the auto selector button. Overall though the cabin does feel a bit utilitarian, but at the same time well built and sturdy. It may not seem as luxurious as some of its competitors but that nonetheless isn't saying much, since your idea of luxury could either swing towards elegant design or a highly functional and intuitive cabin. The seats are large, spacious and supportive. 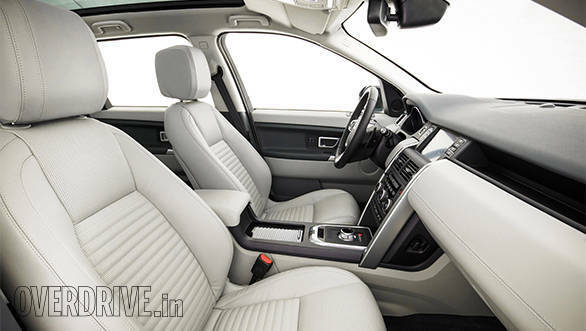 The cabin too is spacious and the India spec vehicle will get the 5+2 seating package. There are advantages and disadvantages to this configuration. The obvious advantage is the ability to carry more passengers which no other SUV at this price point will offer, making this a very attractive proposition. The offset is that the last row of seats folds into the floor, which means you will still get the benefits of huge luggage room but no full size spare wheel, only a space saver. The middle row also folds flat if you need the additional space and it can also slide forward or back to increase knee room. Indian customers will get two engine options to choose from, the TD4 and the SD4. This is the new 2.2-litre 4-cylinder diesel engine with the TD4 offering 150PS and the SD4, 190 horses. Torque is an impressive 400Nm and 420Nm depending on the engine, both kicking in at just 1,750rpm. I drove the SD4 trim level and it's a perfectly capable SUV with brilliantly low NVH. This is a very refined engine with progressive and linear power delivery. The difference between the TD4 and SD4 variants will of course be the efficiency and performance aspects, like top speed and acceleration. It's also a quick SUV, though don't go mistaking the Sport in the name tag to signify scintillating acceleration. The SD4 variant does a 100kmph in a respectable 8.9 seconds with a top speed of around 188kmph. The TD4, on the other hand, takes 10.3 seconds to a 100kmph and top speed is registered at 180kmph. The acceleration numbers for both engine trims were clocked with the automatic transmission which incidentally are quicker than what you get with the manual. This engine comes mated to a 9-speed automatic transmission that targets better efficiency. India spec cars will get the automatic only though global markets will also have the choice of a 6-speed manual. 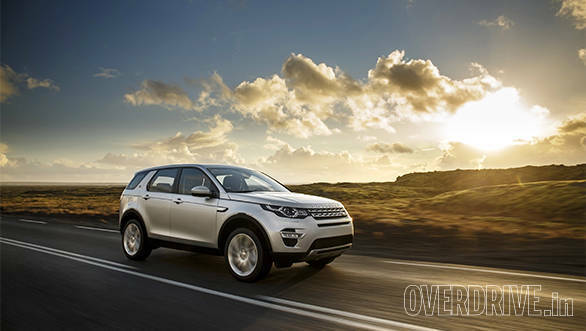 The Discovery Sport also has electronically assisted power steering system aimed at improving efficiency. It's sufficiently light in urban areas and weighs up as speeds increase. Feedback from this unit is impressive, emphasised by the terrain we were driving on which was largely ice and snow. Further efforts to enhance efficiency come from an advanced start stop system which reduces emissions and improves fuel efficiency by 5 to 7 per cent. The powertrain is a full time 4WD system that uses a contemporary and electronically controlled Haldex centre differential. There is, however, also an Active Driveline system that uses two electronic clutches which is optional as of now. Depending on the driving condition the active driveline allows the Discovery Sport to switch between four wheel drive and two wheel drive. The Active Driveline hasn't been confirmed for India yet, but it makes sense given our markets traffic conditions and emphasis on fuel efficiency. The Discovery Sport gets the Terrain Response system which allows a variety of driving programmes to take over the power train. You can, however, only manually switch between these programs. Unlike the Terrain Response 2 system in the more premium Range Rover, the Discovery Sport does not get the auto mode which automatically detects the right driving mode to be in. Nonetheless, it's still a highly capable system and will quite respectably get you out of most sticky situations better than the Freelander could. To add to its off-road capability the Discovery Sport also has around 200mm of ground clearance with an impressive 600mm wading depth. In addition to the standard mechanicals, the Discovery Sport has more electronic items than can be found in Akhiabara, Tokyo's principal electronics shopping district. Torque vectoring, dynamic stability control, electronic traction control, emergency brake assist, roll stability control, electronic brake force distribution and corner brake control provide an adequate safety net. Then there are the fun off-road bits as well, like the downhill descent, wade sensors and gradient release control to keep things in check when tarmac ceases to exist. 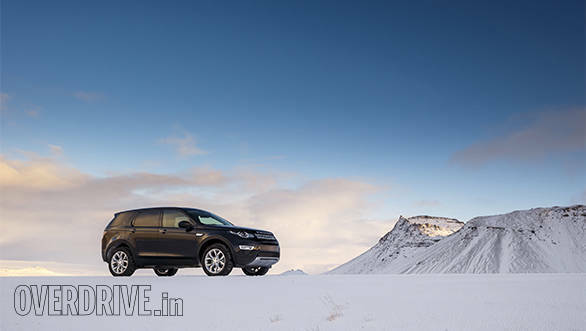 The Discovery Sport is a monocoque based on a platform similar to the Range Rover Evoque. However from the B-pillar onwards everything is all-new. It's about 80mm longer than the Evoque but around 230mm shorter than the Discovery 4. To keep costs in check not everything in the Discovery Sport has gone the aluminium route like the Range Rover and the Range Rover Sport. There is a mix of high strength materials like boron steel and magnesium used in the construction but aluminium does feature in the hood, the roof and the tailgate. Aluminium is also used in the suspension primarily in the multi-link rear unit and all of these contribute to a 17 percent weight reduction compared to the Freelander. The suspension uses a set of magnetic dampers to improve ride quality. Not much of that to be experienced on the Tarmac sections in Iceland but off-road it provides a remarkable sense of confidence. The dampers also take care of front end dive under braking yet balance out the comfort aspect when on road. 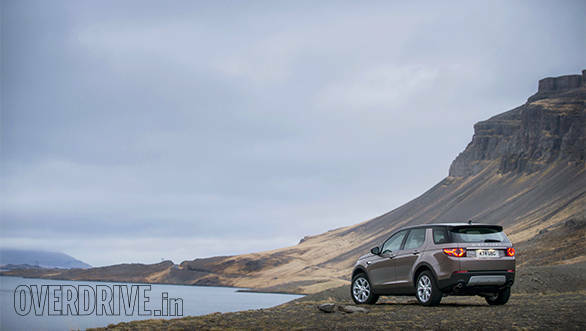 The Discovery Sport is expected to go on sale in India in August 2015. It will be assembled at JLR's facility in Chennai and we expect the pricing to be in the low fifties. With the seven seater package that could be a sweet spot to be in, considering there aren't any seven seat options in that bracket. Land Rover may finally have a fighting chance in the Indian SUV market.